Portland Now Has 100 Street Bike Corrals! from Streetfilms on Vimeo. Above is a Streetfilms Shortie showing that Portland, OR is now up to an astounding 100 bike corrals, far more than any other U.S. city has installed. And they can't keep up with demand!! It's so nice that they aren't anything unusual anymore, in fact they are expected and welcome by businesses. 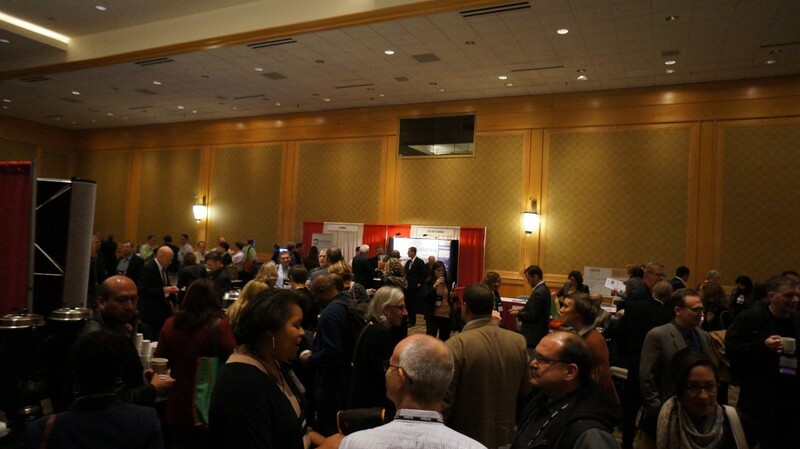 I got to spend a few days at the Railvolution 2013 conference in Seattle. This year they hit a record 1200+ attendees. My solo Streetfilms University session on Monday was a huge hit as we had over 100 people pack a room to hear how you can make your own transporatkltion films in 90 minutes. I'm hoping to do this again in 2014 for even more captive audiences at the Bike Summit in DC in March and ProWalkProBike (ProPlace) in Pittsburgh in Septemeber. Mark your calendars now. And if you want some instant tips, here is an older, abbreviated version of my presentation to watch right now. I didn’t get to make any full Streetfilms there, but got to poke around Seattle a bit and saw two of the more innovative street designs currently in production. Streetfilms Shortie - Seattle's Broadway Protected Cycle Track (Snippets) from Streetfilms on Vimeo. A portion of the new Broadway cycle track opened while I was there. Design wise it is interesting since just about every block looks different then the pervious one. Check out the snippets of video and photos I took above (again, note that some of this is under construction). There were bviously many challenges on this corridor with driveway access, bus stops, and – in parts – the University Link light rail, which is being tunneled as we speak. The other streetscape project I got to walk thru was a four block stretch of Bell Street which is being transformed in to a curb-less corridor between 1st and 5th Streets. The first block is finished and looks promising. I saw it on a grey and foggy day, thus there wasn't too much action on it. The road will become a shared space and thru traffic calming and treatments, cars will go slower. Some parking has been removed and trees, benches, seating and bike racks have been added. It’ll be cool to see what this space looks like in a few more months after the project is fully completed..
Posted in Streetfilms News. Tagged as 2013, Bike Corral, Bike Parking, light rail, Portland, protected bike lane, Railvolution, Seattle, shared space. Portland: Can someone quantify how the new racks have helped? (For example how many bikes that were formerly blocking the sidewalk are now at the corrals? As far as opinions go, how much more secure do people feel now?) How many people are upset cancelling the automobile storage on the street? 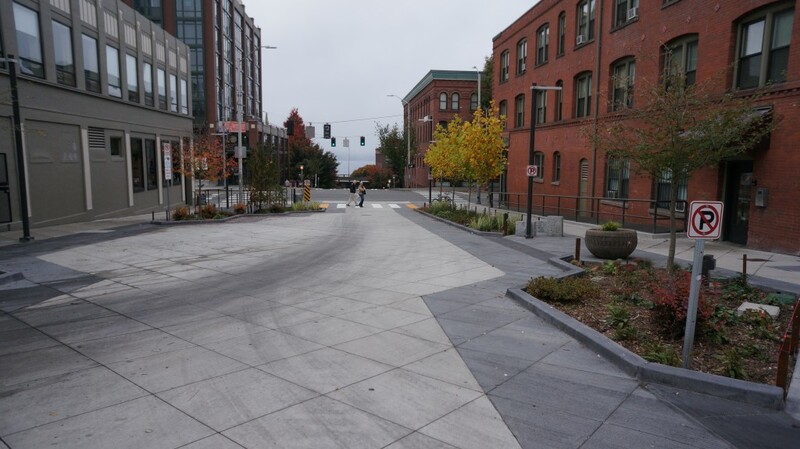 Seattle: The options to one bi-directional were what? Do the intersections have dedicated & separated signalling for bikes? Does the light rail have priority or not? What do locals think about all of this? Does this street have bike corrals?